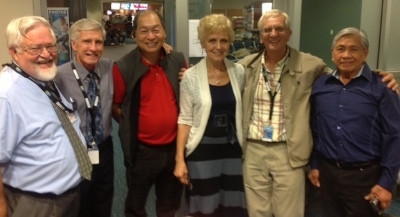 Layne Daggett (left) and Dennis Kirkley (beside Layne) are, respectively, the founding and current lead chaplains of Vancouver Airport Chaplaincy; they are joined by several other members of the chaplaincy/volunteer team. There are 25,500 people working in that little ‘island’ called YVR, or in less technical language, the Vancouver Airport. 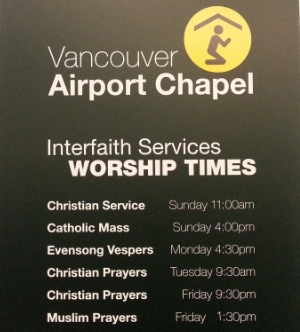 And the airport’s chapel and accompanying Vancouver Airport Chaplaincy (VAC) are well positioned to provide ‘spiritual and emotional care’ to that small city, and to the 53,000 people who pass through each day, according to VAC’s lead chaplain, Dennis Kirkley. Founded in 1983, VAC is an interfaith ministry drawing much of its support and energy from Canadian Baptists and many other Christians. Kirkley, who with his wife Janet, came to Canada from North Carolina a couple of decades ago, has been the lead chaplain for just over a year. He had served in pastoral roles at White Rock Baptist Church and, before that, in Calgary. Between those two postings, Dennis and Janet spent several years in the part of Indonesia known as Borneo. Noting that under its agreement with the Vancouver Airport Authority, VAC is an inter-faith activity, Kirkley makes the point that “This is where God is involved. When God gives opportunity and needs, we respond to them. “The people using the chapel are of faith or no faith – mostly people of some kind of faith. It is not a criteria. And it is a Heinz variety of people,” Kirkley notes. Close to half of the people who use the chapel – both airport employees and travellers – are Muslim. And they make use of the space for their own meditation and worship services. Most of the posted service times accommodate Christian prayers – including Catholic masses and an Evensong. On Fridays, there are scheduled times for Muslim prayers. There are about 45 volunteers, besides the volunteer chaplains. They each do four to five hours a week of volunteer work, including reception. The receptionists are the “first faces” the visitors to the chapel see. And they get quite a bit of orientation in how to respond pleasantly, positively and with as much help as possible to any type of crisis situation. They don’t hand out money – that, Kirkley says, would create logistical problems. But the networking of the receptionists and others, both in the chapel and out walking around, watching for opportunities to help, mean that there is not much downtime for them. Frequently, people of “various faiths will bring prayer requests – related to employment, family and bereavement matters, and to conditions in places like Iraq or Pakistan, where they came from,” to the attention of chaplain volunteers. 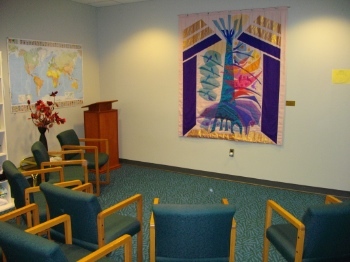 The Interfaith Chapel features the Tree of Life tapestry by Mae Runions. Kirkley tells of one situation, where “the brother of a traveller had to meet him with the news that his wife had passed away. He was crying at gate. The brother wondered if we could bring the man into the chapel rather than being out in public.” The answer? Yes, of course. But physical rest, as much as opportunity for spiritual refreshment, makes the chapel area – located in the international area, close to Tim Horton’s – vital. Murphy beds fold down in a private corner, to accommodate stranded and often exhausted travellers. VAC had direct contact with around 10,000 travellers and employees last year, according to Kirkley. While it is a small number compared to the aggregate total of close to 20 million travellers frequenting the airport precinct each year, it still represents a considerable service for a mostly volunteer organization. Kirkley also tries to make time for speaking to church groups about VAC, as well as providing tours of the chapel and related airport sites to seniors and youth groups. 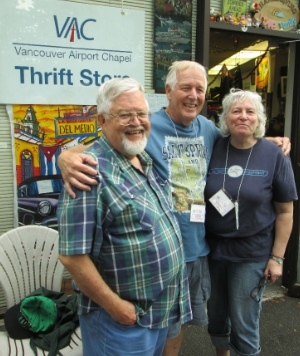 Layne Daggett, left, runs the VAC Thrift Store, along with Doug and Linda Hewitt. Every Friday afternoon, many airport staffers and others, looking for a bargain, head for the VAC Thrift Store, located in a hangar at 4871 Miller Road, at the east end of the airport precinct. Layne Daggett keeps track of the operation, which provides a substantial part of the chapel’s revenue – and solves a big problem for the airlines’ screening processes. Daggett cites the large barrel of what are euphemistically referred to as “left behind” goods, as an example of the double-edged service factor. In the barrel are jack knives, Swiss army knives and other related goods which passengers are not permitted to take aboard aircrafts. There are other goods, too – electronic items, even bikes and motor scooters – donated and made ready by Daggett’s volunteer shop crews. They will post some of the more valuable items in the store’s newsletter and online to attract customers. Daggett’s wife, Helena, has been strongly supportive of his chaplaincy-related activities through the years. So have, at various times, his four children and six grandchildren. It all got started when he was pastor of Broadmoor Baptist Church in Richmond, in the 1980s and some of the church people began Bible studies at the airport. “It just grew from there,” Daggett recalls. In the early days of Daggett’s chaplaincy, he encountered many people who feared flying. He developed a counselling program that addressed those fears, drawing both from his own love of flying (he is an amateur pilot), and his background as a pastor and counsellor. That program grew, even during years when he took time out from the chaplaincy to serve on the National Immigration and Refugee Board and to pastor a dying east Vancouver church back to life. It was called Fear of Flying for many years, but in due course, it made sense to make it sound a little more positive. It is now called Flying Without Fear. “The first person I counselled, back in 1983, is a volunteer, today,” Daggett says. Daggett says in some cases, “we take people to the big air traffic control centre in Surrey, which cares for the whole province of B.C.” That way, people who have a fear of flying can get some sense of the way traffic control works in a busy setting. And, of course, part of the counselling often involves talking about “meditation to keep the tensions down and one’s own prayer life” he points out.